Prospective buyers of newly built luxury homes for sale in Sarasota need not wait for the annual Sarasota Manatee Parade of Homes for a showing of a wide selection of high-end, custom built new residences. All that they have to do is schedule a tour of the Forest at Hi Hat Ranch which flaunts some of the estate home masterpieces of our region’s premier builders. What’s also great for high-end buyers of Sarasota homes for sale, they can pick not only from existing pre-owned residences and move-in ready model homes which are spec builds in this community. The stock of homes for sale in the Forest also include some pre-construction homes, and there is a choice as well to go for the last remaining original developer lots in the property. With a lot chosen, a buyer can the pick from amongst several custom home builders in the Forest. This blue-ribbon lineup includes Arthur Rutenberg Homes, Anchor Builders, John Cannon Homes, Todd Johnston Homes, and Neal Signature Homes. Most of these builders are consistent award-winners in the annual Sarasota Manatee Parade of Homes. All told, this 270-acre community has 54 lots, all are estate-sized and measure between three and six acres. The estate lot pricing in the Forest start from $85,000, and each home site comes as a definition of an unspoiled Florida countryside. The entire community is gated and a haven of stately oaks and beautiful pines. The property likewise has abundant lakes and wetlands that attract a diverse and charming wildlife. The beauty and integrity of the Forest’s acreage is meticulously preserved by the community’s low-impact development guidelines. This exemplary template has been deliberately adopted as the Forest is just the first community of a future master-planned development in the Hi Hat Ranch. Builds of Forest homes for sale must meet the community’s 2,800 square feet of air-conditioned space and 4,000 square feet under roof. Bigger residences in this community that have been put on the market feature floor plans of between 3,300 and 6,700 square feet. Designed with three to five bedrooms, these residences are priced from the $900s up to $2.9 million. In designated areas on or by the lakes within the property, Forest homeowners can go fishing, canoeing, as well as enjoy strolls or picnics amidst pristine natural surroundings. With the approval of the community’s architectural committee, the homeowners can also put up their own tennis courts or basketball courts. 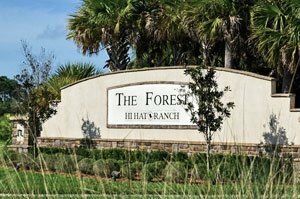 Located on Clark Road just five miles east of Interstate 75, the Forest at Hi Hat Ranch provides its residents convenient access to all the amenities in Sarasota and nearby areas. This advantage has been further boosted with the completion of the upgrades on Clark Road that has no traffic stop signs all the way to the interstate highway. Some of the points of interest easily accessible from the Forest include seven golf and country clubs, over 50 dining venues, myriads of shopping and entertainment centers, and highly rated schools. 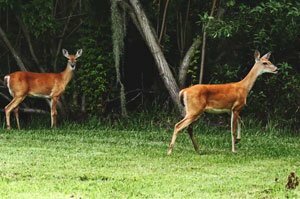 In addition, just a short distance east spreads the Myakka State Park offering outdoor activities that jibe perfectly with the lifestyle theme at the Forest at Hi Hat Ranch. Below are the current real estate listings available at The Forest at Hi Hat Ranch.